Cara Bertrand has a special way of creating a story that ALL readers will relate to. This series follows Lainey, a confused, high school senior who has a special gift. Her kind is call the Setentia, and the people within in have all of the God given gifts you could ever imagine. Cupids have the ability to detect love, Sirens can secretly make a person obey every command, with enough persuasion. However, Lainey is special. She has TWO gifts, with one of them being extremely rare. She is a Diviner, but she also possesses the Hangman's Gift, which means not only can she see "visions" of the future just by her sense of touch, Lainey can also be a murderer, and a savior. The Hangman's Gift allows Lainey to take the life out of anyone that she touches, when she desires to. Her gifts make her a savior, after she rescues Jill from a death that Lainey caused. She is the rarest of the Sententia, and with that comes great responsibility and honor. But there is a catch. Her gifts might just end up killing her. I give this book 5 out of 5 stars. As soon as a reader opens the novel, Lainey's world takes shape, and the reader is sent on a fantastic adventure. Bertrand has an exquisite writing style that is about as unique as her storyline. Her words bring her characters to life, and by doing so, establish a connection between not only the reader and the characters, but the author. There is nothing more valuable that a novel can have. I could not have asked for a better story. I received an Advanced Review Copy of this novel from the Goodreads Giveaway promotion. 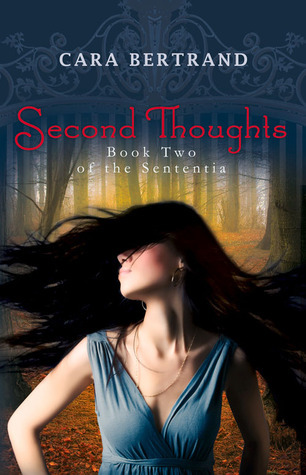 Sign into Goodreads to see if any of your friends have read Second Thoughts.